/3-Lipotropin and /3-endorphin are produced in response to stress together with ACTH and secreted from the corticotroph of the anterior pituitary. 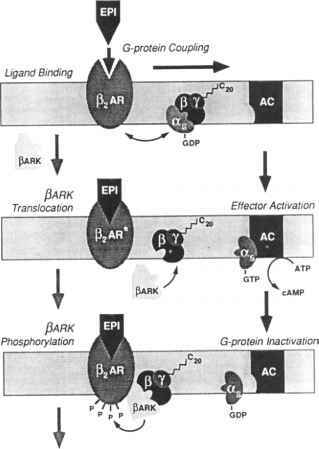 Although enkephalins are smaller components that are contained in the endorphin structure, they appear to be the functional products of genes separate from that transcribing the proopiomelanocortin message in the corticotroph (see Chapter 5). Presumably they can be produced in the CNS by further breakdown of lipotro-pin and endorphin. 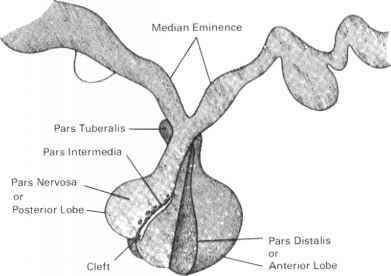 The major source of circulating enkephalins appears to be the adrenal medulla. These are secreted, like epinephrine, by the exocytosis of granules following cholinergic stimulation and calcium influx.